Biomass pellets are a type of biomass fuel, generally made from wastes from wood products manufacture, agricultural wastes, forestry residues etc. Pellets are manufactured in several types and grades as fuels for electric power plants, homes, and other applications. Pellets are extremely dense and can be produced with a low moisture content (below 10%) that allows them to be burned with very high combustion efficiency. According to International Energy Agency, wood pellet production has more than doubled between 2006 and 2010 to over 14 million tons. Pellet-making equipment is available at a variety of sizes and scales, which allows manufacture at domestic as well industrial-scale production. In a typical biomass pre-processing facility, feedstock arrives at the plant in chops or bales. The bales are cut into short pieces using a hydraulic piston pressing the fodder against a grid of knives. The bales can also be shredded using a roller and knife arrangement. If the moisture is more than 15%, the chopped biomass is dried in a drum dryer. Loose cut biomass has a low bulk density ranging from 50 to 120 kg/m3 depending on the particle size. In case of chopped and ground biomass, the bulk density can be increased substantially (~ 25%) by vibrating the biomass holder (e.g. truck box, container etc.). The biomass must be mechanically compacted to increase its density as densified biomass, such as briquettes, cubes, and pellets, has densities in the range of 300 to 700 kg/m3. Pellets are usually in the form of a hardened biomass cylinder, made by extruding ground biomass through round or square cross sectional dies. The unit density of pellets is 960 to 1120 kg/m3 while the bulk density is around 750 kg/m3. On the other hand, typical bulk density of cubes lies between 450 – 550 kg/m3 depending upon the size. In preparation for pelletizing, the dried chops are ground in a hammer mills and mixed with saturated steam which heats and moisturizes grind biomass. For cubing, the chops are not ground and small quantity of water is added to biomass. The steam or water acts as a lubricant to enhance binding. The moisture content of mash before pelletizing is usually 10% while that of chops before cubing is 12%. The pre-processing of biomass may consist only of grinding. The grind will have a bulk density of 180 kg/m3 in the truck box which is suitable for short hauls. For longer hauls and long term storage, it is preferred to densify biomass to pellets or cubes. Dense biomass requires less area and volume for storage and transport than loose biomass. In addition to savings in transportation and storage, granulated biomass facilitates easy and cost effective handling. Dense cubes pellets have the flow ability characteristics similar to those of cereal grains. Bulk handling equipment for granular material is well developed and available commercially. A high-quality pellet is dry, hard, and durable, with low amounts of ash remaining after combustion. 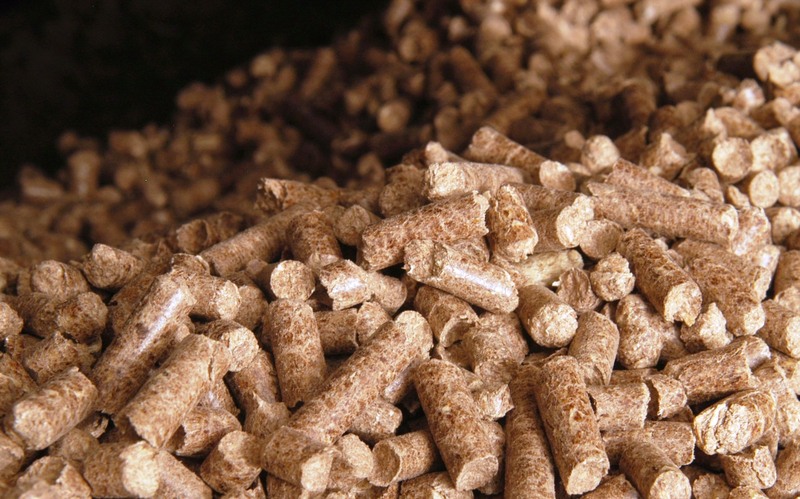 According to the Pellet Fuels Institute, “premium” pellets (which are the most common pellets currently on the market) must have an ash content of less than 1 percent, whereas “standard” pellets may have as much as 2 percent ash. All pellets should have chloride levels of less than 300 parts per million and no more than 0.5 percent of fines (dust). The regular geometry and small size of biomass pellets allow automatic feeding with very fine calibration. They can be fed to a burner by auger feeding or by pneumatic conveying. Their high density also permits compact storage and rational transport over long distance. They can be conveniently blown from a tanker to a storage bunker or silo on a customer’s premises.